A healthy journey with the local community around Green School: Kul Kul Connection. 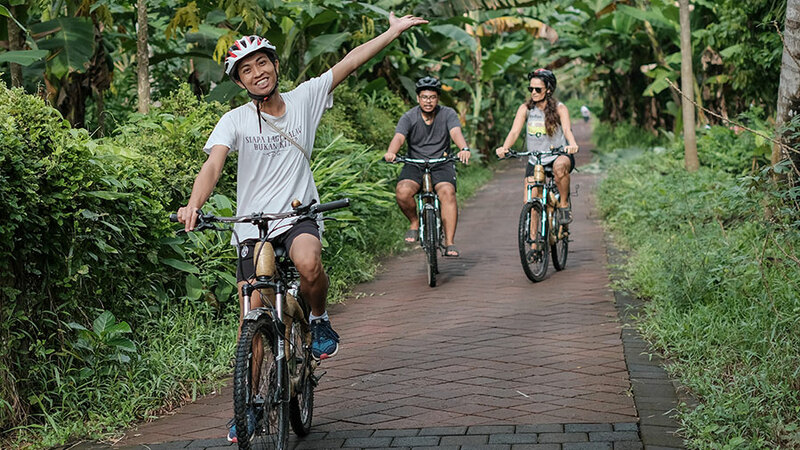 Come explore and learn more about Bali in this unique cycling adventure around the Green School Bali surrounding neighbourhood and community. The tour will lead riders past fields full of flowers, rice paddies, quaint village streets, bustling markets and more. See the beauty of Bali that’s still untouched by tourism. You will interact with local people, sample local delicacies and even get to see how local Balinese families live in a traditional Balinese home known as a compound. The result will be a rich and memorable learning experience which is likely to stand out as a highlight of your visit to Bali. 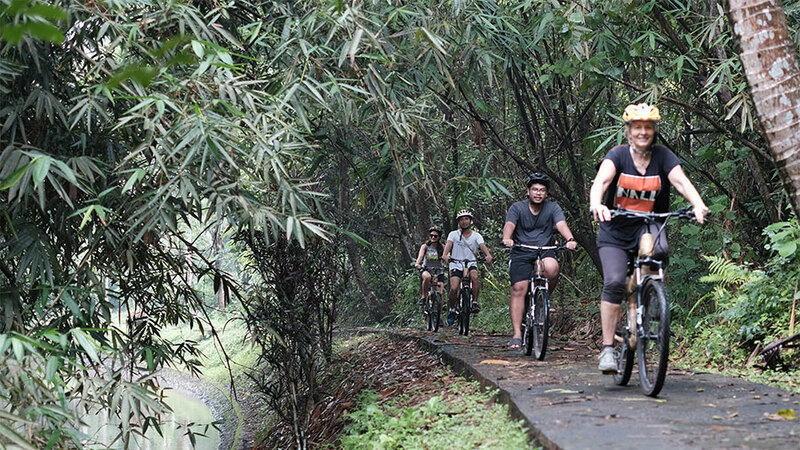 Green School’s Bamboo Bike rides are hosted by Kul Kul Connection, Green School’s community integration program. Kul Kul Connection’s (KKC) role is to bridge the international community of Green School with the local community of Sibangkaja, the village surrounding Green School in Bali. Come and immerse yourself in this cultural experience and be part of our Community of Learners. A great way to explore and learn more about Bali. 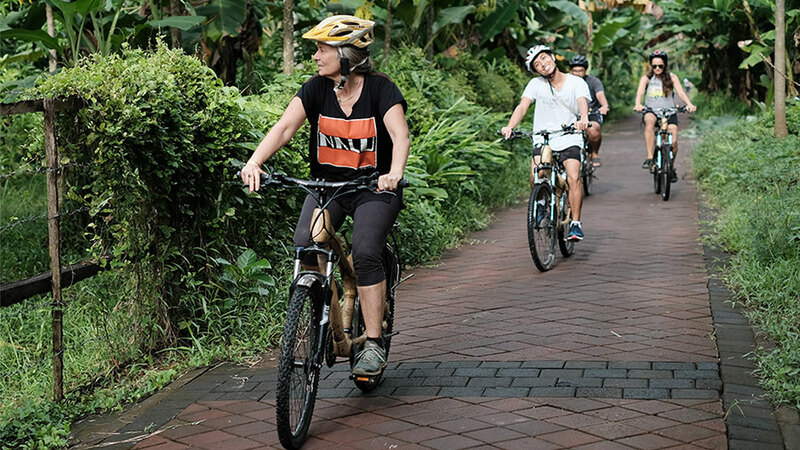 Both the Bamboo Bicycle Tour and the Green School campus tour are led by first aid certified local guides who are parents, students, staff, Kul Kul Connection or Green School’s Local Students. Your safety is our priority. We kindly request that you read the tour guidelines prior to the start of the tour and be in agreement with our conditions. The tour has to be paid in full at the time of booking. Cancellation is 80% refundable up to 1 week prior to the date of the booking. We require a minimum of 3 participants to schedule a tour. Should the minimum number of participants not be reached, we will cancel the tour. In such a circumstance, you will receive email indication that the tour has been canceled 3 days in advance. Due to adult-only sized bicycles, this tour is not suitable for children under 12 years of age. We register no more than 8 participants per tour. The bicycle tour begins at 8:00am but we strongly recommend you arrive at Green School no later than 7:15am. 45 minutes is generally required prior to the tour start time for registration, gearing up and an introduction from our guides. The tour will depart promptly at 8:00am and we are not able to accommodate late arrivals. The Bamboo Bicycle tour will be an adventure! You will sometimes be required to cross main roads which can be quite busy and you will also enter the rice paddy areas where paths can be narrow and muddy. In some areas, it may be necessary to dismount the bicycles to navigate bridges, steep or slippery sections, or broken sections of the path. Please listen carefully to the tour guide’s explanation of safety rules and what to expect at the beginning of the tour. You will be expected to abide by these rules and follow your tour leader’s instructions for the duration of the tour.